New York Rangers President and General Manager Glen Sather announced today that the club has agreed to terms with forward Brian Boyle on a new contract. Boyle, 26, skated in 82 games with the Rangers last season, registering 21 goals and 14 assists for 35 points, along with 74 penalty minutes. He established career-highs in goals, assists, points, power play goals (four), power play points (four), and shots on goal (218). He also established a career-high in games played, as one of only four Rangers to have skated in all 82 games. Boyle led the Blueshirts in shots on goal, tied for fourth in goals and ranked first on the team and 11th in the NHL with 240 hits. In addition, he led the Rangers and tied for second in the NHL with a career-high, three shorthanded assists, and tied for second on the team and 11th in the league with a career-high, four shorthanded points. 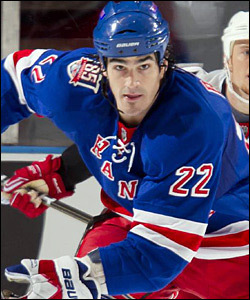 Rangers forward Brian Boyle enjoyed a career year in 2010-11, scoring 21 goals. Boyle was one of five Blueshirts to reach the 20-goal mark for the season. He reached the 30-point and 20-goal plateaus for the first time in his career with a two-point performance (one goal, one assist) in a 6-0 win at Washington on February 25. Boyle made his playoff debut on April 13 at Washington, and led the Rangers with 25 shots in five playoff contests. The 6-7, 244-pounder has skated in 189 career games with the Rangers and Los Angeles Kings, registering 33 goals and 18 assists for 51 points, along with 167 penalty minutes. Boyle made his Rangers debut on October 2, 2009 at Pittsburgh, and tallied his first point as a Blueshirt with the game-winning goal on October 14, 2009 vs. Los Angeles. He skated in his 100th career NHL game on March 7, 2010 vs. Buffalo. In 2007-08, Boyle notched two points (one goal, one assist) in his NHL debut on February 2 at New Jersey, and recorded four goals and five points in eight games with the Kings that season. The Hingham, Massachusetts native was acquired by the Rangers from the Kings in exchange for a third round selection in the 2010 NHL Entry Draft (Jordan Weal) on July 27, 2009. He was originally selected as Los Angeles’ first round choice, 26th overall, in the 2003 NHL Entry Draft.